The Qing Ming Festival is a Chinese traditional festival, which is also known as Tomb Sweeping Day or Chinese All Souls' Day. It's usually occured around 5th April of the Gregorian calendar, which is mainly observed and participated by Chinese communities from China, Hong Kong, Taiwan, Singapore and Malaysia. During the Qing Ming festival, all the Chinese families and close relatives will visit the graves or burial grounds of their ancestors or the loved ones. Traditionally, the elderly and young family members must arrive at the grave sites early in the morning in order to clean and sweep the tombs before the praying ceremonies can be started. The family members will offer some food, tea, wine, incense and joss paper (also known as ghost money or hell bank note) in front of tombs of their ancestors and the departed loved ones. 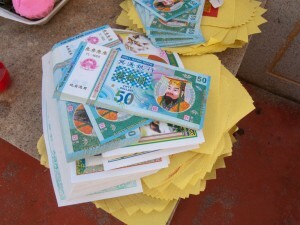 Chinese communities in Hong Kong, Singapore and Malaysia still continue the ritual and customs by offering and burning spirit money (or hell bank note) and paper replicas of material goods such as luxury cars, bungalows, latest gadgets (i.e. Iphone, Ipad, 3D TV, cable satellite decoder, LCD TV), paper servants, clothing, shoes, bicycle, laptop etc. for their ancestors and the departed loved ones and hoping they would live comfortably and wealthy in the afterlife. In Chinese culture, it is believed that people still need all of those things in the afterlife. Then family members start take turns to kowtow three to nine times (depending on the family adherence to traditional values) before the tomb of the ancestors. The Kowtowing ritual in front of the grave is performed in the order of patriarchal seniority within the family. After the ancestor worship at the grave site, the whole family feast on the food and drink they brought for the worship either at the site or nearby gardens in the memorial park, signifying family reunion with the ancestors. STAYING fit, slim and healthy is not only a concern among the living, but apparently among the dead as well this Qing Ming Festival (Chinese All Souls’ Day). Chinese prayer paraphernalia shop owners in Penang have reported an increased demand for paper replicas of full-sized bicycles as well as slimming suits for departed female loved ones who might still be conscious of their figures. Lim Say Saik, 48, a shop owner in Jalan Mesjid Kapitan Keling, said many customers have bought the paper bike replicas for their departed loved ones, especially for those who loved to cycle when they were alive. “The bicycle paper replicas are brought in from China because the quality of the ones made locally are not good. “That is why these replicas are sold at RM138 (US$46) each,” she said, adding that she brought four such replicas for the festival this year and sold two so far. 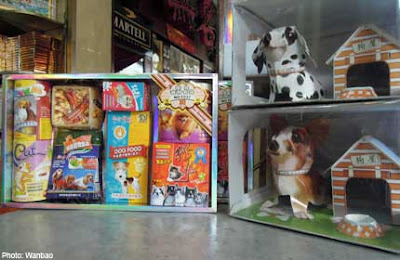 Other popular items this Qing Ming are replicas of pet dogs placed next to kennels inside a box, which are priced at RM20 (US$7) each. “Some customers show their filial piety by burning the items as companionship for their departed family members,” Lim said. Another shop owner G. H. Teh said replicas of slimming suits for women at his shop in Burmah Road were selling like hot cakes. “Out of 10 customers who visit my shop, seven will buy it for their departed mothers, sisters and aunts. “The items, which are imported from China, have been selling like hot cakes since last week,” he said. Teh also said new models of wheelchair replicas from Thailand were also available. “The replicas, priced at RM80 (US$27) each, look very much like the genuine ones,” he said. 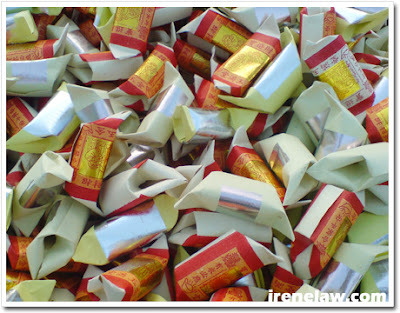 Qing Ming festival, or also known as Pure Brightness Day and Tomb Sweeping Day, will be celebrated on April 4, 5 or 6. It is a time for holding memorial ceremonies at the graves of departed loved ones where food and hell money are offered to the dead to keep them happy. What? Paper offerings for dog lovers? Along Lorong 27, Geylang, one shop is helping dog lovers prepare for their afterlife. Incense shop It Tian Heong has been catering to people who mark Qing Ming for the past 50 years. This year sees new additions: Dogs, dog food, food dishes and even kennels, all made of paper. Said shop owner Ang Chee Kiong, 53: "These products are for people to give to their dog-loving late relatives." He arranged to order the pet materials from a Shanghai manufacturer late last year, following many requests he received from customers over the years. Mr Ang said: "I didn't see the same demand for other animals." He doesn't own a dog. Of the 20 paper dogs he ordered, about half have been sold so far. They sell for $10 each, with breeds like dalmatians and welsh corgis in stock. He decided against cats, although they were available from the manufacturer. But he does sell cat food. Pet food goes for $5 a pack. Other Qing Ming offerings include innovations in female costumes like qipao, make-up and accessories; male innovations include Western-style suits. Check out the iPhone and iPad2 too, retailing for about $4 each. Another highlight is a paper bungalow, which comes with a car, furniture, air-conditioning, domestic helper, security personnel and a guard dog. Such a bungalow goes for between $20 and $45. The tomb sweeping festival falls on April 4 this year. Said account executive Sherry Chua, 22, who owns a golden retriever: "I guess it would be comforting for those who believe in the afterlife that their deceased relative can not only be with their human loved ones, but also with their pets whom some treat as surrogate children." That paper dogs were the latest sacrificial offerings did not surprise student Kamen Ng, 22, who owns a jack russell terrier. He said: "There are a lot of things people burn nowadays like watches and Louis Vuitton bags. But I'm against burning paper symbols of living things. "For example, if somebody's grandfather likes his grandchildren, you can't just burn a picture model of those grandchildren." SEMENYIH: As the number of people treating their pets as family members increases, the Qing Ming Festival has become a time to remember the dead pets, too. The festival, which falls on April 4 this year, is also called the Chinese All Souls Day and families visit their relatives' graves and columbariums to perform prayers and pay their respects. Since the Nirvana Pet Memorial Garden in Semenyih opened five years ago, it has become common for people to visit the graves of their dearly departed pets after paying their respects to their relatives and ancestors. 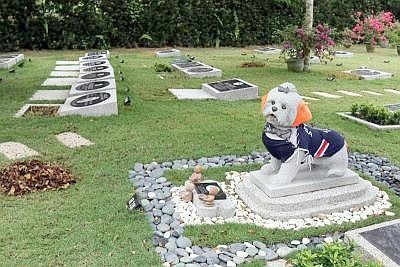 “We have had customers visiting their pets after offering prayers for their family members,” said NV Alliance Sdn Bhd general manager Reeno Kong, whose Shih Tzu Fiffy is buried in the pet cemetery. He expects some of the pet owners to visit the cemetery this weekend as the rituals for the Qing Ming Festival can be performed 10 days before the actual day. While he does not perform similar prayers for Fiffy as he does for his relatives, Kong said some visitors even burned paper replicas for their pets. “Most use the same type of paper replicas they burn for their departed relatives because there are still not many who want to buy replicas made specifically for their pets,” Kong added. He said about 40 to 50 pets were buried in the pet cemetery and most of them were dogs. “However, many pet owners have bought burial plots and our first phase of the cemetery, of about 300 lots, have already been sold out,” he said. He added that the price of a lot was about RM4,800 (US$1,600) and the package came with burial services. Since there have also been requests for pet cremation, Kong said his company was studying the possibility of building a columbarium at the pet cemetery.